We were thrown together in the late 90s, during the time of our work with Unemployed Centres. In an earlier life we would’ve been sworn enemies; sharing a history, but divided by ideology, until the Wall came down and we both changed. Arthur’s involvement with Philosophy in Pubs led him to Nerve Magazine which, at times, seemed to be much the same thing. The difference between Pips and Nerve I would tell him, was that while Pips interpreted the world, in various ways, Nerve just got on with changing it. There were various offshoots from both Pips and Nerve. One was the writing groups. 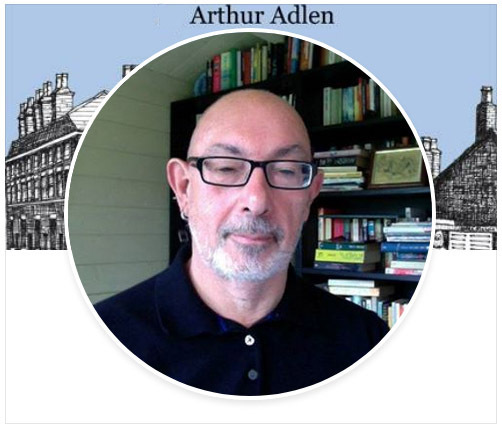 Although Arthur was very direct when expressing his views – he said it as it was – in writing groups, where people were new to writing and expression, he would nurture, encourage and push, stressing the positive, making suggestions, showing genuine interest, teasing out the detail. In conversation, Arthur so often had a witty remark or story to tell of a book, film or song which was “Absolutely Brilliant”. His poetry? Well, you’ve seen the book. And then there’s the music. Arthur got so much out of this and he battled to keep it up even though illness. He believed in an openness to these sessions. He couldn’t abide anyone taking over and dictating how we should play. He had learned from his days of the party machine that you can’t be really creative if you have a rigid format. I think he had become a bit of an anarchist. When Arthur made up his mind, that was it, he wouldn’t move. If he said he would do something he did it. At one of our music sessions in the Ship & Mitre he brought along a new guitar. He lovingly caressed it, extolling its lines of beauty and its tone. Until I told him the decoration on it was Mother of Pearl. He was horrified because he was vegan, and swore never to play it again. I bought it off him, and he was right, it is a lovely guitar. So Arthur had a steely determination. Except, that is, when it came to chips! It’s a ritual, a law, that we have chips in the Ship & Mitre. He told me once he wasn’t going to eat chips anymore, because he was getting fat. But that didn’t work, he liked them too much, especially the skinny, left-over scrag ends. Fridays now are different; sad, but also happy. We’ve sung Arthur’s own songs and his favourites and he’s been there with us. We’ve heard his voice; we’ve left spaces for his words, remembered his emphasis at certain points, his laughter when we all grapple with a new song or technique, and his sublime pride when Cath (his daughter) sang. Last Friday, we had chips as usual and we couldn’t eat them all. Arthur, where are you when you’re needed?